Today we have lost a great member of the Barça family, one who changed the character of our club—the man who presided over Barça for 22 years. Today, Josep Lluís Núñez has left us and, through his memory, may we relive moments and emotions from an extraordinary period in our history. When he came to the presidency, following the first democratic elections in 1978, Josep Lluís Núñez found a club amid, from many points of view, difficult times. During the transition, Catalonia was caught between the excitement of political change, and an economic crisis that had greatly affected both Barça and the country. But his obsession to make his project of a triumphant Barça a reality led him to implement a new concept of management, which, today, is the very essence of Barça. He was the man who made the management of the Club newsworthy, and he was the first to make clear that the clubs had to charge for the audiovisual rights to football. With him, our heritage also made an exponential leap, with the expansion and improvement of Camp Nou and its entire surroundings, and with the construction of the Miniestadi. And with him, La Masia was born, the place where many of the players, that today form part of our mystique, trained and grew up while staying true to a genuine style. Josep Lluís Núñez was clear: he knew that the future of Barça depended on developing local talent through excellence and innovation. At the same time, through his vice-president and friend, Nicolau Casaus, the social area experienced unprecedented growth, with a substantial increase in the number of members, and with an expansion of the supporters club movement that went far beyond Catalonia. But Josep Lluís Núñez was, above all, the president who led that famed journey of 30,000 Barça supporters to the 1979 Cup Winners’ Cup final in Basel, and the one to our first European Cup, at Wembley Stadium in 1992, with Johan Cruyff on the bench, and with the Dream Team on the field. Under Núñez’s tenure, Barça renewed its mentality and definitively became a winning club, not only in the world of football, but in all its other professional sports. 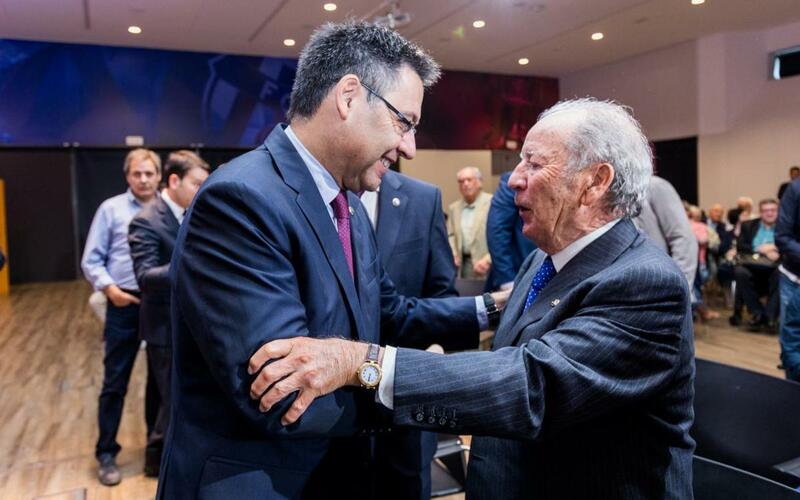 And President Núñez was convinced of the deeply multi-sports nature of FC Barcelona. We will remember him, too, as the President of the Club’s 100th Anniversary, as the one who inspired our Museum, and the one who, until the very end, supported the Club and the team. We will miss your personality, your good advice, and your perseverance. Thank you, Mr. President, for your legacy.